The front seems to be a challenge to everyone learning to evaluate Border terrier construction. We all recognize a bad front when it is lyre-shaped or the forelegs otherwise bent, twisted or tilted, but straight vertical legs are not sufficient to provide good movements. This article will provide some explanations on why this happens, and give some hints on how to find a good front construction. The angulation and muscles usually but not always fall into place if the two first conditions, correct bones and ribs, are fulfilled. A correct cross-section of the ribcage is necessary for a good front. It should be neither too round nor too flat, the shape of an anatomical heart - like an oval that has been flattened at the top. This cross-section makes it possible for the bones to align to the body in correct angles when the dog is standing, and allows for the elbow to slide back and forth in a clean parallel stride. The ribcage also needs to be sufficiently developed to the front, to provide anchor points for the muscles that allow stability and true movements. The point of the forechest should be easily felt. Depending on the amount of coat and muscles it may be seen in a front view. A quick way to check the front is to lift the dog gripping under the chin, just enough to let the front feet lose touch with the table, and see how the paws come down again. A relaxed and correctly made dog usually goes back down in the correct stacked position. If the feet are splayed to the side like in an A shape, or they come forward like in a rocking horse, this is a hint that the front may not be correct. A less intrusive check, which is helpful when assessing puppies, is to slightly rock the standing dog from side to side by pressing your fingertips near the high point of the shoulder. A well constructed dog will usually flex from side to side and does not need to stabilize it's balance by shifting a front foot to the side. Early British breeders argued that a Border front has a correct width when four fingers just fit between the forelegs. This probably applies to males. When viewed from the top, a correct front on a long correctly shaped ribcage has very long clean lines. Some breeders call this desired outline, where the good front and rib are combined with a strong loin and a good croup, a "plank shape". 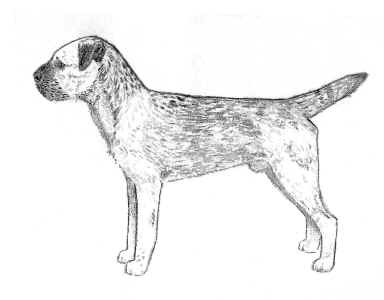 When the dog is not catching the eye but it is difficult to see why, the problem is often an angular neck inset caused by a too upright shoulder. This can be partly disguised by coat when the dog is stacked. A slightly upright shoulder does not have a big impact on the movements, or any impact on the front as seen in a face view. In a side view, the dog may look as though it is slightly leaning forward, however this is often less noticeable when it is on a tight show lead. In worse cases, this fault may cause a swan neck which obscures the point of forechest. In the more pronounced cases movement and sometimes also the front view will be affected since the front assembly cannot align properly to the ribcage. A common fault in Border terriers today is a straight upper arm. This is often combined with - or rather caused by - a short upper arm, in which case a bulging triceps muscle often reveals the problem. However in some cases it is caused by the wrong shape of ribcage. As shown in the illustration, there could be no obvious faults except the angle and alignment of the upper arm. Regardless of the cause, a straight upper arm is always detrimental to movement. 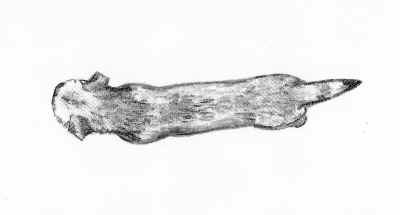 Sometimes a dog with a straight upper arm looks longer than it should from the length of the body, since the eye is fooled by the elbow position. A straight upper arm may cause a front that is wide at the elbows. It may also cause the opposite extreme, where the elbows are placed in front of the ribcage, placing the forelegs very close together. 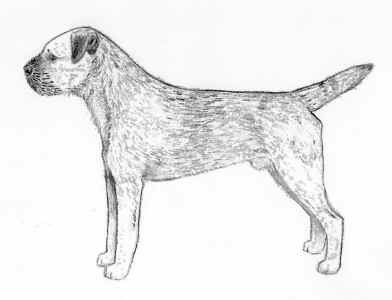 This front construction is actually desirable in some other Terrier breeds as it allows plenty of room in a well sprung ribcage and at the same time a small cross-section of the dog, allowing it to enter small holes when working. However it does not allow for the long effortless stride desired in Border Terriers and presumed to allow them the stamina to "follow a horse" when fox-hunting. In a Border, the small size necessary in a working dog is instead achieved by a spannable ribcage. 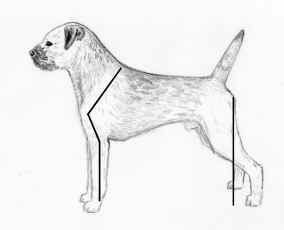 The reason for the "Terrier front's" adverse effect on the movements is that the elbow cannot move in a parallel swing to the rear, because the ribcage is in the way. In a correct front, the elbow is already at the side of the ribcage when the dog is standing, and it can slide against a relatively flat surface when the leg is brought back. 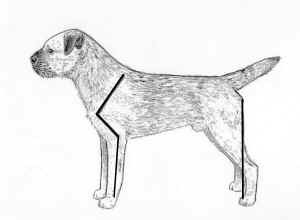 The movements of a "Terrier front" are either wide, wisping, short, or with a high hackney lift to compensate for the rear drive. This may in some dogs give an energetic or bouncy impression but is not a stride that allows a dog to run all day long as a Border Terrier should be able to. 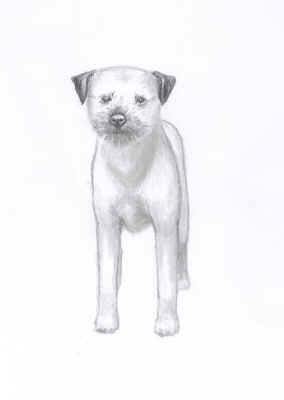 A further hint to find a "Terrier front" is that it usually provides less clean lines when viewed from the top. If the outline of the muscles of the front do not blend gracefully with the side of the ribcage, they often don't align well from a functional point of view either. When angulation is lacking in shoulder as well as upper arm, the imbalance is less obvious when the dog is stacked but front movement is not likely to be good. Some dogs have a nice angulation and balance when viewed from the side, and straight strong forelegs when seen from the front, but are still lacking in front movement. The most likely cause is then that the ribcage has the wrong shape or does not match the rest of the dog in size. The ribcage of a good working dog needs to have some spring for flexibility. However too much spring is undesirable as a barrel-shaped rib-cage does not serve well as a base for the front. It is a challenge for the bones of the shoulder and upper arm to align well to a round shape, like a rider struggling to straddle a heavy working horse. If the elbows don't come out in standing, they usually will in movement. The stride will be either short or wispy. Another reason to avoid a too wide chest is that the size of a working terrier is determined by the size of the hole it can enter. When the cross-section of the ribcage is wide, the dog is effectively too large even if the weight is well within the standard limits. This used to be a common problem 40-50 years ago but is not seen very often today. One reason it has been successfully eliminated by breeding could be that this fault is easier to spot than many others. A short ribcage is much more difficult to spot than a round one. Sometimes it is given away by a long weak loin, or a whippety sloping underline, since a ribcage that is short to the front is often also short to the rear. Sometimes however the only hint is an unstable front movement, due to lack of support for the muscles of the upper arm. In Sweden this construction is called "empty in front". Unstable front movement is not the only reason to avoid this problem, which is quite common today. The stamina required for working underground and following the hunt requires plenty of room for heart and lungs. When comparing two spannable dogs, one with a correct chest and another with a short ribcage, the difference in volume is surprising. Hound breeders also claim that they have seen in practice how a short ribcage provides less protection for internal organs when the dog is moving fast in rough terrain. 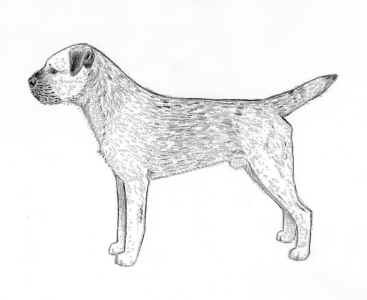 Border Terriers are special among terriers in that their historical task includes mixing with the foxhounds and following the hunt, as well as doing underground work. Mixing with the foxhounds requires the typical temperament, socially fine-tuned and ready to go rather than always at tension. Following the hunt requires the smooth efficient stride discussed above. Together, the two traits create an impression that is very different from many other terriers and indeed many other show breeds. It is a true challenge for a terrier judge to "put on a new pair of glasses" when the Borders enter the ring. Moderation is a motto when the correct Border Terrier conformation is described. For sure a good Border should not look common, but on the other hand it should never be looking glamorous at the expense of function. A good front construction is essential for balance, and balance is essential for type. A balanced Border should stand on its feet, not hang between them. Imagined lines of force counteracting gravity should go vertically up from forefeet to the point of the shoulder, and from rear feet to the point of buttock. 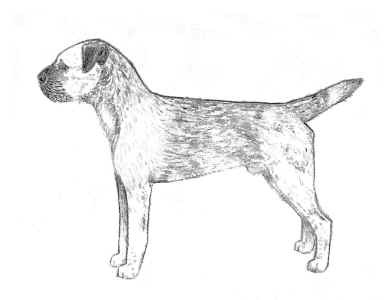 However a type like the illustrated, where a Terrier front is combined with a short ribcage and over-angulated rear, is sometimes perceived as more "showy" than the correct one. Since the feet are shifted away from the body centre in the "showy" type, a lot of tension is required to keep the stacked position, while the balanced dog can be more relaxed. On the move the "showy" dog is likely to be over-handled, so that the front end effectively hangs from the show lead and the front paws swing in the air, to disguise the fact that the front stride is not able to match the drive ofthe rear. The balanced dog will move well without a lead. The typical well balanced Border may not be as eye-catching when stacked, but to the Border Terrier connoisseur watching it move like a rippling water stream - possibly with a handler struggling to keep the pace - is the most beautiful thing in the world.